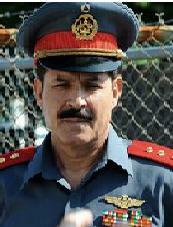 Dawran, Mohammad Masoomi Lt. Gen.
Name Dawran, Mohammad Masoomi Lt. Gen. The ANAAC now (2009) operates from Kabul, Gardez, Jalabad, Herat and Kandahar airfields. The ANAAC is to be a total of 7,400 personnel and 126 aircraft. There will be 5 wings established until 2015. ANAAC Headquarters – Kabul , Major General Mohammad Dawran Kabul Air Corps Training Center(KACTC) - Kabul Opened April 2008. Classes in Aviation English, Basic Fire Fighter, Air Corps Orientation, Introduction to Computers, Basic, Maintenance. Mi-17 Crew Chief, Literacy Course, Logistics Course, Aerial Gunner, Fire Officer. VIP Transport Detachment - Kabul, equipped with 3 transport helicopters. Latifa the only woman pilot in the Afghan National Army's Air Corps blames the commander of the Afghan Air Corps, Major General Mohammad Dawran for the death of her 36-year-old sister and fellow aviator, Lailuma. She died on July 17, 2006 from complications during childbirth at Kabul's Rabia Balkhi Maternity Hospital.